When campaigns lag in delegates they sometimes deflect attention to other more favorable measures in the hope of getting reporters to treat them like those objects in sideview mirrors which are closer than they appear. We saw this in 2008, when some Hillary Clinton supporters claimed the nomination should go to the candidate who had won the most aggregate votes in the primaries, an argument with great face value appeal but absolutely no bearing on how actual nominations are decided. Another version of this argument is that the candidate who did best in general election swing states should win the nomination because if her opponent cannot win primaries in key states like Pennsylvania, then he risks losing them in the fall. In addition to having the disadvantage of faulty logic (case in point: Obama suffered a big loss in the Pennsylvania primary but won the state easily in the general), this point, too, has no bearing on how nominations are decided unless you want to believe that superdelegates will be persuaded by faulty logic to support the runner-up. 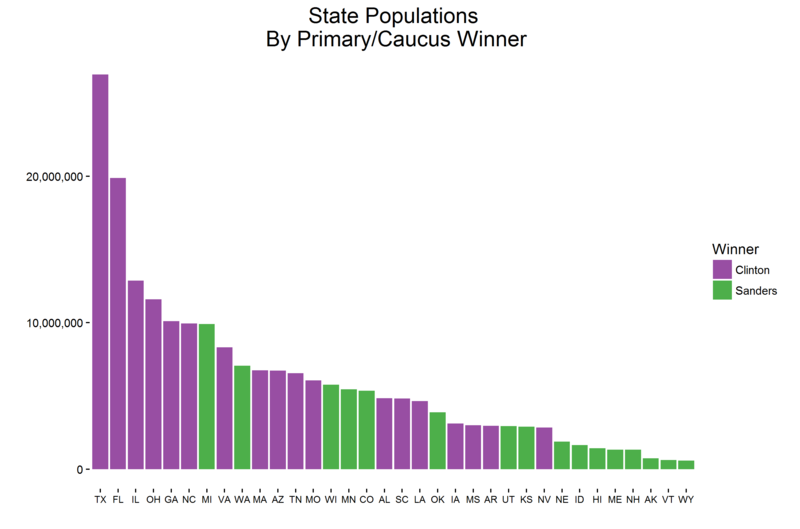 This year, the potential for narrative spin revolves around the number of states won by each candidate. There is a possibility that Bernie Sanders will win more state contests than Hillary Clinton but still lose the nomination. Thirty-four states have thus far participated in Democratic primaries and caucuses and the victory tally is close, with Clinton having won 18 states to Sanders’ 16. But Bernie still trails in the delegate count because with few exceptions Hillary is winning populated states with large concentrations of delegates. And it’s the delegates – only the delegates – that matter. 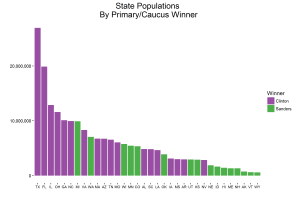 The figure makes clear just how well Hillary is doing in states with larger populations. The ten largest states by population to have voted at this point are Texas, Florida, Illinois, Ohio, Georgia, North Carolina, Michigan, Virginia, Washington and Massachusetts. Hillary has won eight of these. Bernie, in turn, is cleaning up in Kansas, Nebraska, Idaho, Hawaii, Maine, New Hampshire, Alaska, Vermont and Wyoming, losing only Nevada among the ten least populated states to vote so far. Because reporters look to individual contests to drive the horserace narrative of the campaign, wins and losses are assigned more value in the campaign story than they deserve. A primary contest without twists and surprises is a dull primary contest, and it’s hard for even the most experienced reporters to avoid building expectations by affixing the “must win” label to primaries where the outcome may not actually determine the eventual selection of the nominee. On this score, Sanders’ twin defeats in Illinois and Ohio on March 15 were a large blow to his ability to drive the horserace story. The above figure would look quite different if two of the four largest bars were green, and the narrative would have changed accordingly, even if Sanders still lagged behind Clinton in total delegates (which he would have). Michigan, which looks like an anomaly, would have had the company of two other populated Midwestern states, and Sanders would have been able to claim widespread appeal in the region of the country often credited with deciding elections. This in turn could have influenced how his campaign was perceived as it moved into other delegate-rich states, with the chance that Sanders’ press-generated momentum could have boosted his performance enough to help him close the delegate gap with Clinton. But the value of the narrative rests only with the number of delegates it can produce for the candidate, not in the number of states won. When Obama was victorious in 2008, his delegate advantage came from lopsided victories in many of the small caucus states Sanders is winning by large margins this year, but unlike Sanders, Obama was able to win his share of delegate-rich larger states. No matter how much the press will make of individual victories, the delegate math is more simple than the narrative. You win the nomination by winning states where the voters live.